Today, I explain to you how to choose the best table tennis blade. This tutorial is based on my several years of training, playing and coaching. I also have some occasions to discuss this topic “How to choose the best blade and rubber” with some Chinese coaches. I will help you choose the right blade and then combine with the best forehand rubber, and the best backhand rubber. This combination should fit your playing style. The table tennis racket is made by the blade and the rubbers. The main difference between Chinese philosophy and Western philosophy about the racket is Speed and Spin. Chinese coach says “The blade should be an extension of your hand”. The blade gives you the feeling, and that’s the blade will help you “SPIN” the ball. While some Western coaches emphasize the “Speed” behavior of the blade. So in general, Western players will choose OFF, OFF+ blade to gain speed, and combine with softer rubber. While in China, players prefer OFF- blade, and play with very hard rubbers. I’ve tried and played with both combination “Fast blade + Soft rubber” and “Flexible blade + Hard Rubber”. And I can confirm with you, the latter setup will help you “Improve faster!”. If you are still confused, read my own experiences in coaching young and beginner players! The “feeling” is crucial in table tennis. Chinese kids spend a lot of time to feel the ball. In all of the equipment in table tennis, I would say the blade is the most important one! You know that the rackets are made by the blade and the rubbers. Table Tennis Blade is the wooden part of the racket. The blade is considered the soul of your playing style. Defender, Allround, Offensive players choose a different type of blade. That’s the reason that you should focus on your blade! Choose the highest quality possible! So if you can investigate 120$ for your racket, spend about 80$ for the blade, and 20$ for the rubber (2 sides cost 40$). The high-quality blade is not the cheap and mass production one. It’s the premium quality professional bat made by the experienced maker. Best table tennis blade offers more spin and crisper feeling during ball contact. It is the key to increase your potential of winning. So focus on the quality blade which matches your playing style. Remember, a good racket can make the same spin with a shorter stroke than the low-quality racket. Butterfly Viscaria (Read review/ check price 1/ price 2) is considered one of the very good blade in table tennis. It provides a good balance between “Speed”, and “Spin”. The “spin” quality is good. (This is the word of Zhang Jike during an interview). Or Stiga Infinity VPS? Which one is a high-quality table tennis blade? While Butterfly racket has a huge market in the US, and Europe (because they are faster, and harder). Stiga racket is preferred in China. Many top provincial Chinese players use the Stiga Clipper (check price), or Stiga Infinity VPS (custom handle) (read review/ check price 1/ check price 2). Important! The handle choice is also very important. You should read this article to understand why top Chinese players prefer larger (custom size) Flared handle. Check for the several handle variations here for Stiga handle here: AN Winner, Champ Handle, FL Master, ST Classic, Wide FL Legend. Stiga racket in general used “Ayous” outer-plie. While Butterfly prefers using “Koto outer-plie”. But nowadays, with the “New Trends In Table Tennis”, players tend to play with the harder, and faster racket to deal with the plastic ball. Search on my site “New Trends” to learn about this modern tendency in table tennis. If you want to keep one racket from the beginning to a very high level, you can stick with the Stiga racket. Yes, we want the highest quality blade! But how to know which one has the top-notch quality. There are many things about a good blade, I will make a PingSunday video and explain it on my YouTube channel. Many things that I want to explain to you the “art of table tennis blade making”. But I need time. I will share and explain to you all of this when I have free time. In modern table tennis, professional prefer faster and harder blade. With the new ball, players get harder to impact the spin to the ball. Harimoto Tomokazu also confirmed that playing with a more flexible racket give him confidence. So what is the wise choice here? All wood blade is thin (thinner than 6.0 mm) and flexible, a must for beginner players. It provides feeling and flexibility. Some amateur players made the wrong choice. They have picked very fast carbon blade. And this ruined their early development stage in their ping-pong career. Even some top player like Xu Xin, prefer sticking with all wood players. To increase the speed, you can choose the 5+2 composition blade (5 layers of wood and 2 layers of ALC). Carbon blade is hard and stiff. It’s not good for beginners. The hardness eliminates the feeling of the service and service return. The stiffness reduces the good vibration to your hand. All of these pieces of information are crucial to new players (to learn the techniques). 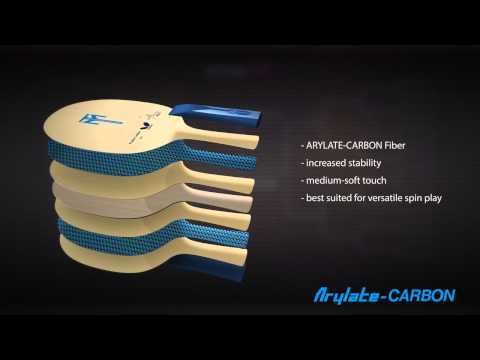 Use only carbon blade if you are the advanced player, and your playing style is more close-to-table hitters. At present, composition blades (5+2) are the most popular not only for the amateur level but also among top professional players. They are not the same. New players often confront these 2 terms. Hardness is the feeling of the outer-ply of your blade. It depends on the hardness of the outer-ply of your blade. The soft outer layer will give a softer feeling. While stiffness depends on the composition, the thickness of the blade. The stiff blade doesn’t have vibrations. Carbon blade is stiff. And stiffness is the opposite of flexibility. The stiff blade is less flexible and inversely, the flexible blade is less stiff. There are many good table tennis blades out there. All of these rackets share the same properties: Sharp feeling, clear vibration, and powerful! In general, there are some very good brands like Butterfly, Stiga, Double Happiness, Nittaku, Darker, OSP, Tibhar, Yasaka, and Donic. This list is not exclusive! You should consider it as the reference for the very good blades for a serious table tennis player! Viscaria (read review/ price 1/ price 2) is no doubt one of the most famous blades of all time. It’s popularized by the 4th Grand Slam player Zhang Jike. This blade is very all-round. Fast, spinny, and very good for the backhand flick, and backhand topspin attack. I wouldn’t recommend this blade is if you are a beginner still learning the basic strokes. You would be better with a classic 5 plies wood like a Nittaku Acoustic or Violin. This is an all-time classic blade for offensive players! Playing style: topspin attack style close to mid. Balanced for both backhand and forehand. Timo Boll Spirit (Read reviews/ FL handle/ ST handle) is supported by Timo Boll. It’s great for the European looping style of play. The blade has a good balance of speed and control. An overwhelming choice by many Butterfly sponsored players. Note: Timo Boll is using the ST handle blade. While most Chinese players play the Timo Boll Spirit FL handle. If your level is the intermediate level player to a national level, then this blade is for you. One of the best all-round blade in table tennis. But if you found this blade is slow, then you can try Timo Boll ZLC (check price) or Zhang Jike ZLC (more info). Looping on both sides have a lot of control! When combined with ESN rubbers, or Tenergy rubbers, the racket creates heavy spin. This is a blade made for the playing style close to mid-distance. Playing style: looping style mid to far. Favorite by forehand dominant player. Hurricane Long 5 (Check price/ Read reviews) is a looping machine. It is fast but has excellent control! Good amount of flexibility makes easy to “spin” and “feel” the ball. Combined very well with hard rubber on Forehand H3NEO 40 degree, or Gold Arc 8 47-50 hardness). This blade is for looping style because it has a good dwell time and large head size. The biggest con of this blade is that it is really heavy and when you put 2 hard rubbers it goes around 200 grams. This blade is more for professional players, if you are new to the sport I don’t recommend it. Primorac (Check price/ Read review) is one of the Butterfly’s overall best-selling shakehand blades. This blade provides good feel and control. It is an excellent all-round offensive blade. It’s the best-selling Butterfly blade for a reason – very well balanced – its 90g, very comfortable handle, good control, good speed, the feeling is pleasing. One of the best all-wood blade right now! However, for the new ball, you can consider the Primorac Carbon (review/ check price). This is a 5-Plies blade (3 Wood + 2 Composite). The composition exact is: (Hinoki 1.2mm, Tamca 0.25 mm, Kiri Core 4mm, Tamca 0.25 mm, Hinoki 1.2mm). The Nittaku Acoustic (check price/ read review) is an amazing 5 Ply Offensive blade with Limba outer layers. It has an amazing feel with a very clear vibration. One of the old blade used by Ma Long. Power and speed are very good for an all wood blade. The main strength is the feel and consistency. Great for developing players and advanced players. Very high build quality by Nittaku. This blade is #1! If you have one, keep it as a gem. It’s a unique feeling, control is wonderful! This blade (Hinoki blade more info/ check price/ read review) is a legend! It’s the best one ply Hinoki blade in the world! Nothing can replace the feeling that you get from a Darker Speed 90 in your hand. This blade is highly dynamic, offering great touch and the slow speed at low impact and huge power with a high spin at high impact. The optimized thickness and shape provide a highly stable blade with the largest sweet spot. If you don’t like vibration, Darker Speed is for you! It gives virtually zero vibrations. Stiga Clipper (Master FL handle, Champ Handle, CPen Chinese Penhold / read review) is a legend, used by many Chinese players. This blade is very popular in Asia. Used by Liu Guoliang, this blade is for players who want an all wood blade without sacrificing speed and power. Even in the modern plastic ball era, this blade is fast enough to compete with other offensive class carbon blades. For the new poly ball, you can play with Stiga Clipper CR. Used by Gao Ning and several Chinese provincial team members. Good alternative: Stiga Carbonado 145, and Stiga Rosewood NCT V.
Pair Stratus Power (Check price/ more info) with medium hard tensors and it will make miracles for you. This is the most balanced blade. Its main strength is the control and spin ability. Very good for European, 2 wings looper style. There are few blades as consistent and reliable as this one. Fit well with Chinese on forehand 729 Friendship Focus 3 or DHS Hurricane 2) and Stiga Mantra M on the backhand. The Stiga Allround Classic (check price/ read reviews) is a truly classic blade. The best choice for all levels. Strokes of all kinds can be executed with precision and quality. High-quality spinny loop, high arc attack, and spinny serve! The best all-round ALL blade! Suite well for beginners and intermediate players! Very balanced blade! Very spinny, good vibration! I think a lot of people complain about the lack of speed but I don’t think that’s really a problem. It’s all about the techniques! If you feel that you lack power in your shot, you should consider buying: Stiga Infinity VPS V or Stiga Allround Classic WRB. Yasaka Ma Lin Extra Offensive (check price/ read review) is a fast blade with good speed and a large sweet spot. Many players in my club play with this blade. I’ve also tested it. Very good control, and spin. It’s light also. If you want a good and light blade, which is easy to flick, to drop shot, backhand smash, this blade is for you. However, far from away the table, it lacks a bit of power. I recommend this blade for new players, to intermediate player. The center veneer is a little bit thicker and harder, which gives additional power. One of the best 5 plies blade! Not very stiff, well balanced. Suitable for close and play away from the table, for both celluloid 40 and new plastic 40+ ball. Its Stiffness allows for stable passive blocking. Solid quality blade. Great for looping close and mid-distance. The CPEN version is also very good. Using Stiga Allround Classic with Black Donic Bluefire M1 on FH and Red DHS Neo H3 40 degree hardness on BH. The Stiga lack of speed is compensated by me playing placement at hard to reach near the edge & net play. You’ll need a bat that gives you lots of feeling to play the placement strategy. hi coach, is hurricane long 3 best for amateur players? yes, you really like the Chinese forehand techniques. No, if you play European styles. Do you like the new viscaria? Am I unlucky or all new viscaria have some strange vibrations? exactly! every player searches the old version of Viscaria (bronze tag) – clear vibration. I don’t like the new version! too hard, and less feeling. You are right! The Ma Lin Yasak blade is a really good blade. I have a pen holder version of it and the feel is just incredible. I use a Stiga Oversized Allround WRB handle blade. I love it. I own two of them. They are both getting old and I would like to get a new one but it is no longer being made. Can you suggest any oversized blades that feel like the Sitga Oversized blade? What do you think about the waldner world champion 89(off) by Donic? I have tried some blades, and found that this one suites me the best. Any comparisons to cheaper Yinhe blades? I am learning lot from your coaching till date.Thanks for that. I have tried all 3 Ma long versions;[Malong 1 ; 3 & 5]I am using ST handle only. Then Can you pls tell me the opinion on Malong 1 which i liked that too the straight Handle [ALC Blade];Is that good to use;I am using Chinese rubber on FH Battle BLue sponge & European control Rubber on BH. I need to know about the comparison of timo boll alc and viscariya…which one is better coach…. Hi, from the text I understans that without carbon is better, but in the first 3 places I see carbon blades. I am a bit confused. Is it a good combo?I am looking for something within 50 USD.Thank you. What kinds of blades will you suggest for medium pips or short pips on BH close to the table play ? Coach why Timo Boll ALC is not included? I search the internet and I have read that it is widely use by Pros. In fact 12 Pros uses it including Timo Boll. hi Ronald. Yes, Timo Boll ALC is one of the best blade. It’s like an upgrade version of the Timo Boll Spirit. Yes, It’s is the #2 in the list. 🙂 You are right! Timo Boll ALC is so so good right now! I use to play with a DHS power G7 with Rakza 7 on both sides. But it use too heavy for me and was tough for me the lift the ball over the net on my backhand. To be very honest, i ma quite weak on my back hand. Right now, I use a Donic Senso Carbon blade. I use Xiom Vega Euro on FH & Andro Rasanter 37 on my BH. Is this a good set up? or the BH is too soft?I like to play topspin shots on my forehand. Please advise if i need to change my rubber or blade. I will change the rubber after 3 months from now as it shows signs of wear & tear. Would you consider doing an article on equipment / set-up for modern defensive players? So far, your article are geared towards the modern power looping style. But No. 9 seems to be explained something wrong. The title says Offensive Classic, while the photos and contents are for Allround Classic. Please check. I love your detailed analysis of TT and your passion about it! Hi KS. You are right. For me, both Allround classic and OC are good. But for the new ball, we should use OC (beginners). Allround classic is too slow with the bigger ball. Hi EmRatThich, I would like to know if Butterfly Primorac or Stiga Offensive Classic is more flexible and perceivable. Still I need to improve my strokes. so I couldn’t wait for your reply and I bought a Stiga Offensive Classic WRB blade with forehand Hurricane 3 Neo 2.1mm black commercial ~51° (ESN) + backhand Stiga Mantra M 2.1mm red ~49°. I must say i would like to buy Butterfly Primorac but in Germany Butterfly is really expensive. But after reading and watching for maybe 60 hours all your recourses i can’t make a big mistake. Now i can’t blame my Equipment, all i need is seriously training. Hi Coach – thank you for the article. 1) Which rubbers would you pair with the Acoustic? 2) Do you have any thoughts on the OSP Virtouso OFF- blade? Why did you forget about Stiga Carbonado 45 ??? You are right. I love Carbonado too. I will add it in the article. Have you used osp blades? What’s your view on the osp expert for someone learning? OSP Expert is a big head ALLROUND blade. Good feeling, so many spin, many flexible. For new player, it’s very good. For intermediate player, it’s too slow. OSP Expert is good for forehand, but for backhand, it’s too big, and not as fast. I will say YES for someone learning. For the long term, you should play Viscaria (best blade for backhand attack). If you are beginner, you can play OSP Virtuoso (Small head), good for backhand topspin. And I now both play for myself and as a trainer. Thanks so much for your wonderful intelligent video explanations of (Chinese) philosophy of table tennis! I have learned so much the past week from your videos! And I am happy to say that you explanations generally support, what I have been teaching our young players for the past couple of years. + I learn much more from you. Thanks so much.. I bought a table tennis bat in China ten years ago, but I don’t know if it is a good choice for me to play with. I think that it works for me, but as I have been learning from you that one should rather prefer a more flexible and not so offensive bat, I wonder, if I should perhaps buy a less offensive bat. Do you by any chance know the bat, which is called zhong hui, FL, “Off”? I have kept a 729 on my bh and just bought a Rakza 7 for my fh. What do you think of Innerforce ZLC. I bought used from a friend about 4 years ago who said it was too fast for him. I like. Has good control and feeling to me. I use Tenergy 05. I heard that a lot of coaches recommend this blade for their students. I am not a beginner, having played for many years. Como melhorar o controle…mudar pra Madeira off ou alround? Do ping pong paddles make difference? in one of your article, I see that you differentiate the difference between ping pong and table tennis, and you state that blue sandpaper bats are the standard ping pong paddles. how many kinds of sandpaper bats? What makes it different? how to choose the best ping pong paddles? ping pong paddles are sandpaper and hardbat style. I will explain it, if you really want to play hardbat table tennis. Can you compare the butterfly viscaria and the stiga carbonado 145 . Which of these two blades is better in terms of quality and durability ? I am a spin/loop based player . Is it good to buy used blades if you can get them 30% cheaper? the blade has only been used for a few weeks. Yes. It’s good! to buy a used blade! Nothing wrong if you buy a used blade. Just profit and buy that blade! I’ve also often bought a used blade with 50% reduction. Like a Viscaria with only 60USD instead of 130USD. your coaching videos and information is too good for armature players. What about Stiga Carbonado 145, is it used by Fan Zhendong? which rubber suits for this blade for both FH and BH, for armature players. Please tell, what rubber fits well with Nittaku Acoustic? Is cheap Chinese rubber like DHS PF4, or Friendship 729 FX Bluesponge (about 12 dollars each) suitable for this blade? Or what rubber will You recommend for Nittaku Acoustic? Can u please compare the stiga carbonado 145, butterfly jun mizutani super ZLC and butterfly viscaria ? which blade has larger sweetspot and is more durable? which do you recommend? I am a mid distance looper . What about Nittaku Barwell and Barwell Fleet, many people said it’s a good blade, balance between spin, speed and control. There is a mistakes in your article about top 10 blades composition of primorac classic is wrong.